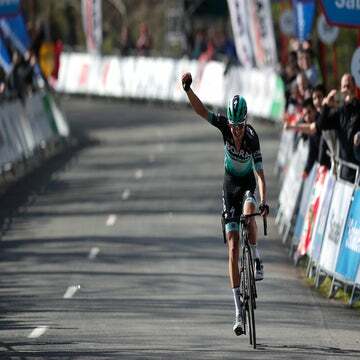 Max Schachmann (Bora-Hansgrohe) continued to dominate the Tour of the Basque country with another win in stage 4, Thursday. The German won from a four-up sprint on a wet and wild day in the Basque country, extending his GC lead in the process. 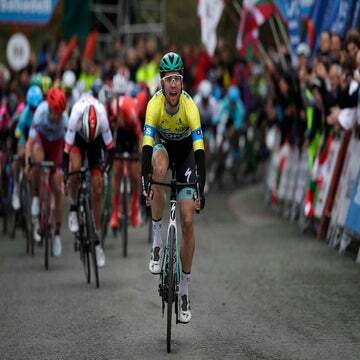 The sprint came after Adam Yates (Mitchelton-Scott), Jakob Fuglsang (Astana) and Tadej Pogacar (UAE-Team Emirates) attacked off the front of the peloton on the final climb of the day. Pogacar took second and Fuglsang took third. Schachmann now has a 51-second advantage on the overall over his teammate Patrick Conrad, with Ion Izagirre (Astana) third at 52 seconds. After the late crash in stage 3, key GC rival Julian Alaphilippe (Deceuninck-Quick-Step) failed to start the stage, and Michal Kwiatkowski (Team Sky) lasted only 74 kilometers of the 164km hilly stage before abandoning. The Quick-Step man does not have any major injuries, but is looking to rest bruises and abrasions before his Ardennes campaign. On a cold and wet day in the hills, the peloton was fully bundled up, and the attritional conditions meant that of the seven men that formed the breakaway early in the race, only two remained when the acion all came together with 15km to go. The race was contested on the final Zaratamo climb, a 4km highly irregular ascent that included downhills and ramps over 11%. With the peloton all together as the climb bit, Yates put in a searing attack and built a small gap, before being joined by Schachmann, Pogacar, and Fuglsang. The quartet cooperated well on the more steady slopes at the top of the climb, reaching the summit – which fell only 3km from the line – with a 10-second buffer over the peloton, who seemed reluctant to chase in the harsh weather and greasy roads. Pogacar lead out the final kilometer, with Schachmann glued to his wheel. 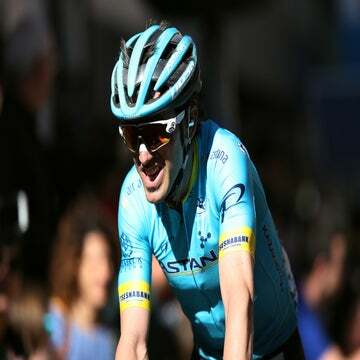 The leader’s jersey-wearer benefited from his strong position and patience to come around the UAE-Team Emirates man in the final hundred meters, claiming his third win in the race, and second in two days. Schachmann has two more stages to protect his 51-second lead on GC, with two days to come in the mountains. Stage 5, Friday, features a barrage of leg-stinging climbs, including an ascent to Itzua, which features several stretches over 20 percent, and a finale on the 5km, 8.8 percent climb to Usartza. With riders in first and second on the GC, Bora-Hansgrohe will be looking to keep a close reign on any danger in a day that could favor a breakaway.